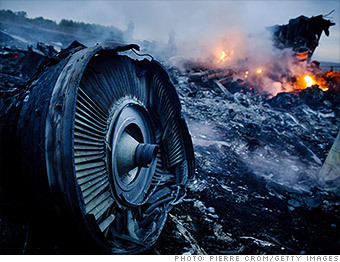 Debris from Malaysia Airlines Flight 17 is shown smouldering in a field July 17, 2014 in Grabovo, Ukraine near the Russian border. Wall Street was dealt a fresh pair of jolts this week. First, a passenger jet was shot down in Ukraine, threatening to escalate tensions between Russia and the West. And then Israel launched a full-scale ground assault in Gaza, adding to the unrest in the Middle East. It's too early to say whether these latest risks will stop the bull run, but so far the stock market has kept on going up despite numerous obstacles -- geopolitical and otherwise. "They've all turned out to be uneventful for the stock market, and actually good buying opportunities," Ed Yardeni, president of investment advisory Yardeni Research, wrote in a recent note. Take a look at what's spooked the market...so far.